The person who owns her heart..."
Oh my this book delivered the twists and turns. Just when you thought you knew how things were going to go, it went in a completely different direction. I really like this series and how it twists your view of ethics and morality. I also love that it takes New Adult and throws a dystopian twist to it. Evalyn is such a unique heroine and I love her for that. She blurs the lines of good and bad and she is just herself. She tries to make the right choices but it's hard to know what the right choice really is. I love how she persevere through and that she wants to atone for her sins. I also love the lengths she is willing to go to for those she loves. I also love Casey and Valerie. Both of those characters are so complex and I love that. Casey and Evalyn together are great and I spend so much time rooting for them to make it work. I think they work so well together and while I don't always like the choices Evalyn makes in respect to them, I do completely understand it. Valerie is just awesome and I love how tough she is. I think my favorite thing about this book, and the series in general, is the way all of the characters blur the lines of good and bad. There is no black and white here, everything is a different shade of gray. All of the characters have done something reprehensible but at the same time you can see what drove them to act the way they did. None of their crimes were random acts of violence. They were all driven to do the things they did because they loved someone else. I'm not saying that excuses what they did, but it does make you question it. Despite it all you root for these characters that are supposed to be "evil". This book definitely took the series in a direction I wasn't expecting. There is so much more to the Compass Rooms than I ever expected and I cannot wait to uncover more secrets. This series is just so different and it keeps me coming back for more. 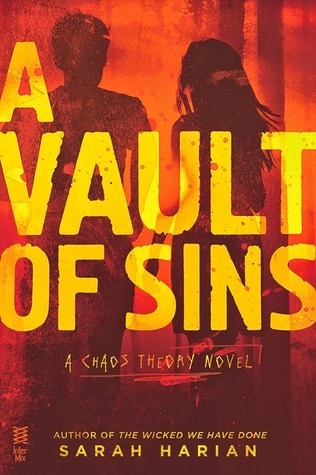 All in all A Vault of Sins is a great addition to the series. I highly recommend this series to dystopian fans and to those looking for something a bit different. Not a series to be missed. I love a good, twisty, complicate story! Great review! Great review! I haven't heard of this series yet, but I'm definitely interested now. I've been looking for a dystopian book to read lately too. I especially love ones that are really twisty and unpredictable. I don't like strictly goody/baddy characters either, it's the gray ones that incites strong emotions from me and gets me really involved. Also it's so cool that NA is breaking away from it's contemporary mold. I love when I encounter unique heroines! And I do love a book filled with a lot of good twists and turns! The reason why you like the characters also makes me interested in picking this one up because I know that will be one of my favorite aspects of the book as well! I'm glad you are enjoying the series!!! Loved you review!! <3 you!! Magen I really hope you get to read this series one day... it is so different and just stands out! Wow! This sounds fantastic, Teresa. And I love twisty plots that keep me guessing and make me think. I'll have to pick up this series. Excellent review, my dear!